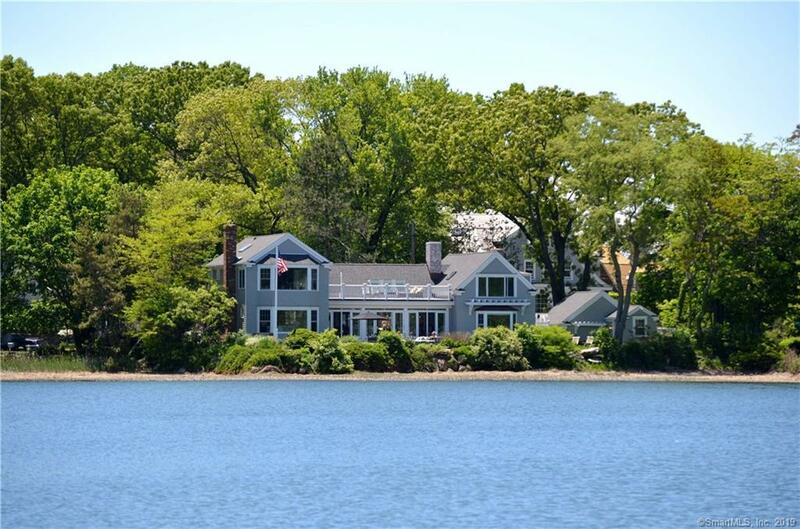 This is an amazing opportunity to enjoy a beautiful waterfront home in the coveted Pine Point Association. It is situated on a rare parcel of 3 lots directly on Farm Creek with a view of the Bell Island "jumping bridge". The privacy of the property afforded by its oversize lot is rare in Rowayton. The professionally landscaped gardens are exquisite. The open concept main level provides perfect space for entertaining and making the most of the water views. Have an early morning cup of coffee from the private balcony off the master suite which also includes an outdoor shower. Parking is no problem. In addition to the 2 car garage there are 2 driveways which can accommodate 8 cars. A short stroll from the house leads to the private South Beach where you can enjoy the company of your neighbors, take a swim or build a sandcastle. A mooring can also be dropped giving you easy access to a boat for your sailing pleasure.